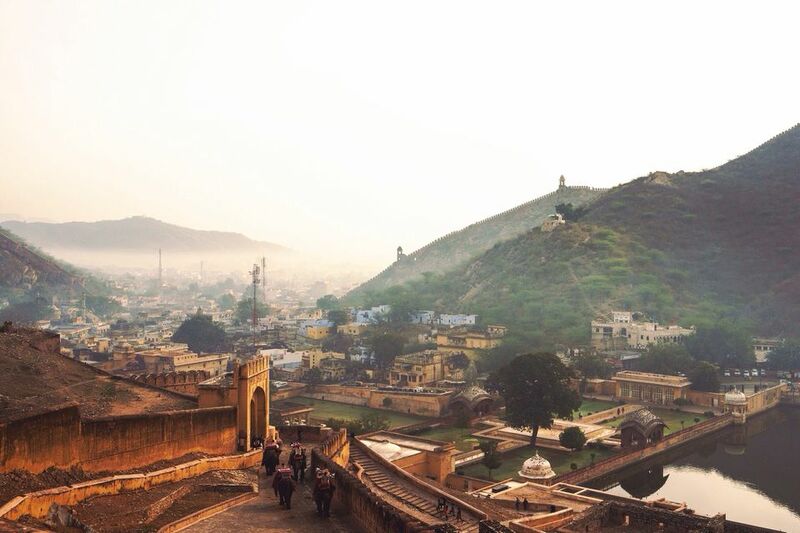 Many of the top attractions in Jaipur are located in the Old City. They're not really spread out, so can easily be explored on foot. Use this guide to go on walking tour of the Jaipur Old City, or if your legs get tired, take one of the prevalent cycle rickshaws. Duration: Allow half a day to explore properly. Start: From Panch Batti circle and the old world Raj Mandir cinema, head along M.I. Road, which is the main thoroughfare. If you have some cash to splash, M.I. 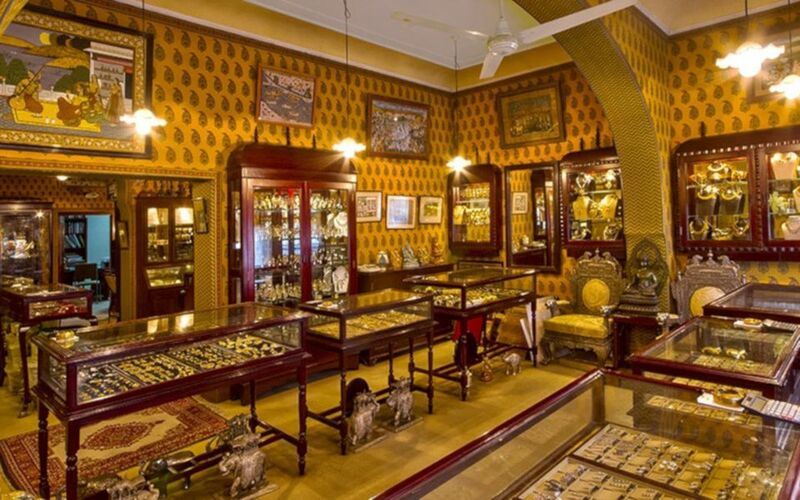 Road is where you'll find all the high-end shops including the Gem Palace and Juneja Art Gallery, two recommended places to go shopping in Jaipur. Juneja Art Gallery is definitely worth a browse if you like contemporary art, including abstract, semi-abstract, surreal, and figurative art. Likewise, the Gem Palace is an attraction itself. Owned by the family of jewelers that once served the royal family, its been in existence for eight generations. The interior has been likened to Aladdin's Cave, which some magnificent pieces on display that belonged to the royal family. Continue along M.I. Road, and you'll come across the pink walls of the Jaipur Old City on your left. There are three gates, spaced around 500 meters apart, which provide entry into the Old City. The first one is Ajmeri Gate, followed by New Gate, and lastly Sanganeri Gate. Enter from Ajmeri Gate and turn right. From there you can walk all the way along to Sanganeri Gate and the start of Johari Bazaar. The Old City is surprisingly well laid out, with its wide, straight streets running in a grid which forms a series of bazaars. The first bazaar that you'll encounter is Nehru Bazaar. It's situated on the road between Ajmeri Gate and New Gate. A favorite with the women of Jaipur, it's full of shops selling brightly colored fabric, shoes, trinkets, and perfumes. Bapu Bazaar lies on the road between New Gate and Sanganeri Gate. Many shops sell styles of clothes and bags that foreign tourists like. Keep an eye out for the marvelous, huge banyan tree on the right, with its mass of intertwined branches. Stroll along and browse through the shops until you reach Sanganeri Gate, the third gate, and Johari Bazaar. Johari Bazaar lies opposite Sanganeri Gate, on the road that leads north to Badi Chaupar (big square). Turn left into it and walk straight. If the jewels at the Gem Palace were a little out of your league, you might find the offerings here to be more suitable. Johari Bazaar and the lanes that run off it are known for gold and silver jewelry, as well as inexpensive costume jewelry and bangles. Keep walking straight, and you'll reach Jaipur's most famous landmark, the Hawa Mahal (Wind Palace). This marvelous example of Rajput architecture was built in 1799 by Maharaja Sawaj Pratap Singh. It was made so that the ladies of the palace could look out over the street, from the small windows, unobserved. There are 953 of these windows in total, spread over five levels! However, unfortunately, there's not much wind in the Wind Palace these days, as many of the windows have been sealed shut. There's a rooftop cafe opposite the Hawa Mahal where tourists go to get a fantastic view of the monument. It's also possible to go inside the Hawa Mahal from around the back. Some people don't realize that it's actually possible to go inside the Hawa Mahal -- you can, and should! To find the entrance, head back in the direction that you came from, and go right at the intersection. Walk a short distance along the road, then take the first right into the alleyway. There's a big blue sign there that points to the Hawa Mahal. Next stop on the walking tour of Jaipur Old City is the magnificent City Palace. There are two approaches that you can take to get there. One is to walk back past the Hawa Mahal and turn left. The other is to keep heading along the road that you were on (known as Tripolia Bazaar) and turn right near Tripolia Gate. If you're feeling a bit tired from walking, you can hail a cycle rickshaw. The distance isn't far, so you shouldn't need to pay more than 15 rupees (bargain hard). There are various ticket options for the City Palace, depending on how much of it you want to see. You may also get a special ticket for exclusive access to the Chandra Mahal (where the royal family lives) with a personal guide. The City Palace blends Rajasthani and Mughal architecture, with the most recently constructed parts of it dating back to the early 20th century. Behind the main courtyard, you'll be able to see the towering seven floor, Chandra Mahal. The flag of the royal family is hoisted when the Maharaja is in residence. In case you're hungry or thirsty, there's a lovely outdoor cafe at the City Palace. The most stunning part of the City Palace is without a doubt the Peacock Gate. It's located in a small courtyard known as Pritam Niwas Chowk, accessed via an exit on the far side of the main courtyard of the Jaipur City Palace. Pritam Niwas Chowk has four colorful painted doorways, each representing a different season. The magnificent Peacock Gate is dedicated to fall/autumn and Lord Vishnu. As you head out of the City Palace in Jaipur, you might want to stop by Jantar Mantar. This observatory was built by Jai Singh in 1728. He constructed five in various cities in India (including Delhi), and this one's the biggest and best preserved. On first glance, Jantar Manter actually looks like a collection of massive and strange sculptures. However, each of them is actually an astrological instrument with a specific purpose, such as calculating eclipses. The largest instrument is a sundial, which casts a shadow that moves up to four meters an hour. If you're lucky, you might get to see a camel pulling a load along the streets of the Old City of Jaipur. Camels aren't as prevalent as they used to be, but they're still around! From Jantar Mantar, follow the road out to Tripolia Bazaar. Many of the shopkeepers there specialize in selling kitchen utensils. Tripolia Bazaar gets its name from Tripolia Gate, with its three archways. This is actually the main entrance to the City Palace and Jantar Mantar. However, only the members of the royal family and their guests are allowed to enter that way. Nearby is the tallest structure in Jaipur -- Iswari Minar Swarga Sal, the heaven-piercing minaret. It serves as an excellent reference point as to your location. It's possible to climb to the top of the tower and get a breathtaking view of the Old City.